Slab with an inscription in the sidewalk. this land was in my trust. nothing and lost it forever. These words refer to a fictional opportunity lost by citing terms from the land grants to soldiers/settlers at the time of Ottawa's early British development. It was necessary to erect a structure of about the same size as this monument within a year of taking possession if you wished to retain/obtain a lasting title to the land. 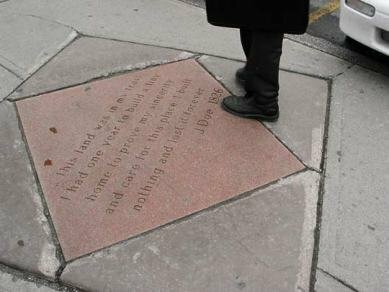 At the time this monument was installed, this end of Rideau Street did not look too good - there were lots that had been vacant for a very long time. It is much improved today. Source: Justin Wonnacott (2008). Wonnacott - Rideau Street.